The Trash Pit is an area within Bowser's body in Mario & Luigi: Bowser's Inside Story, and is apparently located in Bowser's large intestine. It is, as implied, full of miscellaneous junk. When Mario, Luigi, Starlow, and all the other people in the meeting at Princess Peach's Castle get inhaled by Bowser, Mario falls into the beginning of this area. Mario then stumbles upon Starlow, who is trapped in an amoeba. Once Mario frees Starlow, a Goombule battles him. After the battle, Mario and Starlow proceed into another room, where they find Luigi, attached by his head to a pipe-like object with a bubble. They free him, and then stumble into ten Attack Pieces, and Mario and Luigi learn how to kick a shell at their enemies. Mario and Luigi also get the hammers and learn how to use them in this area. Once the bros. finish the Trash Pit, they will be able to access other areas in Bowser's body. The Funny Bone, Toad Square and the Challenge Node are the first areas that get unlocked. Here is a list of overworld items found in this area during the events of Mario & Luigi: Bowser's Inside Story. Mushroom x3 In the ? Block in the lower-right of the second scene. In the ? Block before the exit in the fifth scene. x3 In the ? Block above the stairs in the eighth scene. 1-Up Mushroom x3 In the ? Block in the seventh scene. Syrup Jar x3 In the ? Block in the first scene after the hammer area. x3 In the ? Block in the right of the final scene. Attack Piece One is in the first scene after the hammer area, eight are in the second scene and another is in the third. Hammer Found in a crate in the hammer area after the elevator. 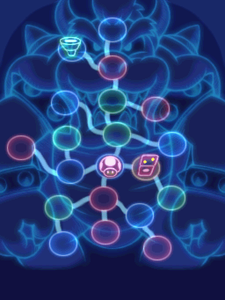 This is one of the four places in Bowser's body that contains Attack Pieces. The others are the Pump Works, Flab Zone and Energy Hold. Despite being in Bowser's large intestine, The Trash Pit is clearly in his armpit on the map of his body. This is the only large area in Bowser's Body that the bros can fully access at any time. 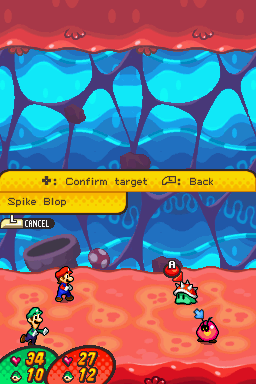 The Trash Pit was called the Junk Spot in the demo for Mario & Luigi: Bowser's Inside Story. This page was last edited on December 30, 2018, at 20:47.